Dublin is a city of beer, pubs and literature. Only the mention of the name Dublin will make people world-wide think of Guinness. And lovers of literature will also think of Dublin’s many authors; Joyce, Behan, Shaw, Swift, Yeats, Wilde and Stoker. This entry was posted in Ireland and tagged authors, beer, book, Dublin, literature, pub crawl on September 3, 2015 by Traveltorgeir. I visited the Laughter Lines Comedy Show in Dublin in July 2014. We looked at each other, we both knew what time it was. In seven hours we had to take a taxi to the airport. We had promised each other not to be out late tonight. 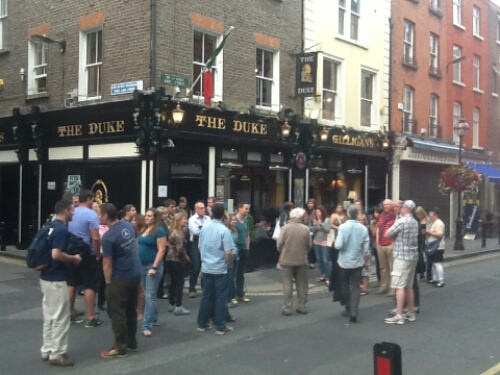 This entry was posted in Ireland and tagged comedy, Dublin, improv, last night, the Duke on June 10, 2015 by Traveltorgeir.